Abstract: An Inmarsat 4 L-band phased array antenna is designed for given specifications. 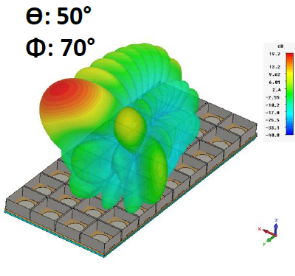 The design process starts by selecting and designing a suitable single array element for an L-band phased array. 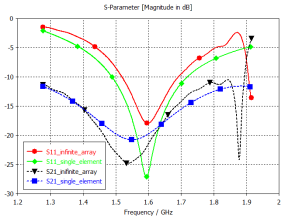 Antenna Magus  is used to investigate potential candidates and two known topologies (the Circular EM coupled patch and the Dual fed circularly polarized patch) are combined in CST Studio Suite® . 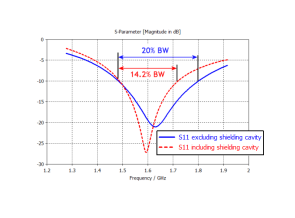 In order to reduce mutual coupling between array elements shielding cavities are introduced. Although these cavities do reduce mutual coupling, the array element's impedance bandwidth is reduced and no longer meets the required frequency specification. A third topology in Antenna Magus, the Circular stacked pin-fed patch is combined with the first two elements, resulting in a new element with wider bandwidth (20%). Once the shielding cavity is reintroduced, the bandwidth of this new element is reduced to 14.2%. This bandwidth, however, still meets the required frequency specification. 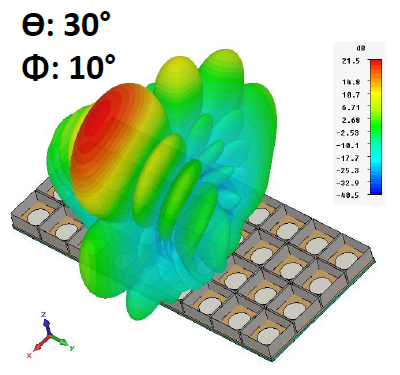 The final 36 element phased array antenna is synthesised using Antenna Magus in conjunction with CST Studio Suite. The synthesis includes calculation of the required element excitation magnitudes and phases to achieve a specified squint angle to allow for electronic beam-steering. Simulated results of the array radiation pattern for a specified squint angle are shown. Keywords: Antenna Magus, Array synthesis, Antenna design, CST Studio Suite, Circular polarization, Dual feed, EM coupled, L-band, Phased array, Mutual coupling, Shielding. Inmarsat is a British satellite telecommunications company which provides worldwide telephony and data services via portable or mobile terminals which communicate to ground stations through eleven geostationary telecommunications satellites . Planar phased arrays designed to operate at L-band (1518 - 1675 MHZ) are typically used on commercial aircraft for Inmarsat 4 satellite communications. The main beam of the array has to be electronically steered between 0 - 360° azimuth and 0 - 180° elevation. Beam properties Electronically steerable point beam with nominal gain of 12 dBic and max 17 dBic across majority (85%) of the spherical coordinate system with SSL of +- 13 dB. Steer angle 360° azimuth, 180° elevation. The operating bandwidth of an array is mainly determined by the impedance bandwidth of the individual array elements. The process of selecting which element would be best suited to the given requirements (like bandwidth, impedance, feed network, substrate etc.) is accelerated using Antenna Magus. Numerous elements can be considered in a relatively short time and these elements can even be combined to create novel elements that leverage the characteristics of various antenna types to better meet the design requirements. The first step in the array design process is the choice of an appropriate single array element. From the given specifications (shown in Table 1) the bandwidth requirement is 10% and we are looking for a planar element. Using Antenna Magus' the keywords, "planar" and "moderate bandwidth" (between 10% and 70% bandwidth) results in 18 suggested topologies out of the database of over 208 antennas. By including additional search terms like "circular polarization", results in few elements that lend themselves to array inclusion. So a second search for "circular polarization" and "planar" results in a second set of options. 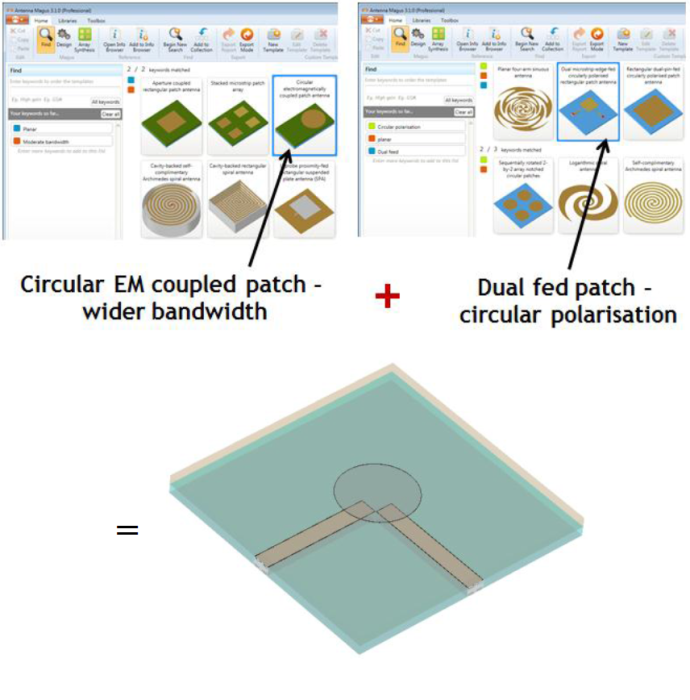 By following this approach in Antenna Magus, two topologies are identified that can be combined to create a new suitable element: the Circular EM coupled patch (which provides sufficient bandwidth) and the dual feed mechanism of the dual fed circularly polarized patch (which provides circular polarization). This combination results in a Dual fed EM coupled circularly polarized circular patch shown in Fig. 1. Antenna Magus' exported models can be used to easily generate the new structure in CST Studio Suite. The new structure simulated in CST has an impedance bandwidth of 13.4 % below |S11| = -10 dBi and maximum gain of 7 dBi at the centre frequency. Fig. 2: S-parameter results show the effect of unwanted mutual coupling in and infinite array. B. In-array performance of the first candidate element CST Studio Suite's periodic boundary method is used to create an infinite array to calculate the effect of mutual coupling between individual array elements. Fig. 2 shows S-parameter characteristics of the single candidate element as well as the same element in an infinite array (all elements excited equally and in phase). Both S11 and S21 are dramatically affected when placing the element inside an infinite array environment due to strong mutual coupling between the elements. The effect of the mutual coupling will worsen when applying a feed network using different excitations to steer the main beam. This would cause more of the radiated energy to leak into adjacent elements as the squint angle increases , making accurate and efficient electronic steering impossible. By placing the element inside a cylindrical or square cavity, the effect of mutual coupling is reduced. This, however also results in a reduction in performance bandwidth. S-parameter results in Fig. 3 show a decrease in impedance bandwidth from 13.5% to 7.7% which no longer meets the given requirements. Fig. 3: Addition of a shielding cavity around individual array elements reduces impedance bandwidth. Information about wide-band planar antennas in the Antenna Magus database indicates that stacked patch antennas are able to achieve wider bandwidth than single patch elements. This increased bandwidth is realised by including an additional patch element and substrate with a slightly lower resonant frequency above the existing structure. Loose coupling between the bottom and top patches results in wider impedance bandwidth . 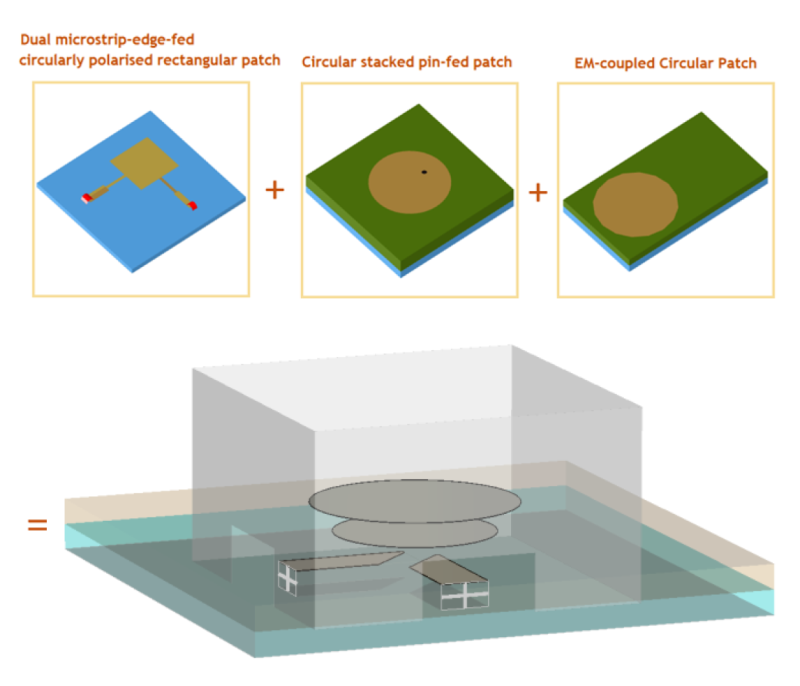 Using this principle, a new array element - a Dual fed EM coupled circularly polarized circular stacked patch can be designed by combining 3 antenna topologies from Antenna Magus as illustrated in Fig. 4. Fig. 4: 3 topologies in Antenna Magus combined to design a new Dual fed EM coupled circularly polarized circular stacked patch. Fig. 5: S-parameter results of the Dual fed EM coupled circularly polarized circular stacked patch. (a) S11 including and excluding square shielding cavity. (b) S11 and S21 including the shielding cavity in isolation (green and blue traces) and in an infinite array (red and black traces). The second candidate antenna was designed and optimised in CST Studio Suite. Some adjustments to the feed had to be made to improve the real and imaginary impedances. This was done by increasing the feed line width to reduce the reactive component of the input impedance from 10Ω to the desired 0Ω, while increasing the resistive component from 40Ω to 50Ω. Fig. 5(a) shows the S11-parameter simulation of the second candidate antenna with and without the shielding cavity. When comparing the bandwidth performance of the first and second candidate elements (excluding the cavity shielding) we see that the second candidate element has a 20% bandwidth. This is 6.5% more than that of the first candidate! By adding the shielding cavity, the bandwidth is reduced to 14.2%. The effect of mutual coupling is again investigated using CST Studio Suite. S-parameter results in Fig. 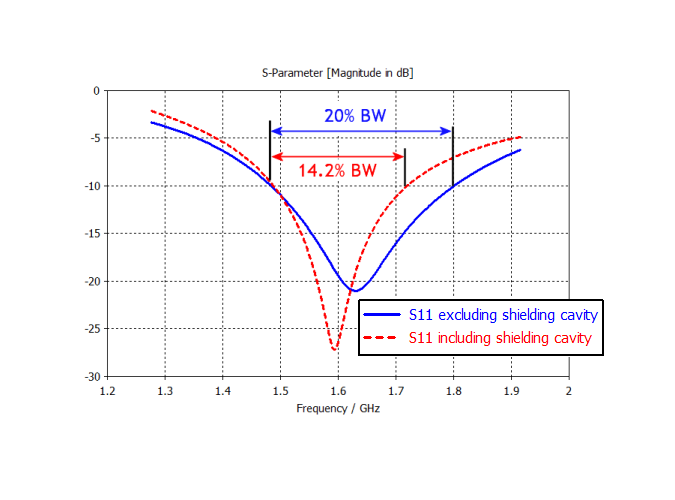 5(b) show that due to mutual coupling, the impedance bandwidth decreased from 14% to 11%. This still meets desired 10% bandwidth specification for the final array. The array synthesis tool in Antenna Magus was used to design and synthesise a 36 element L-band array which fits inside the given physical design specification. Fig. 6 shows the synthesised array layout with phase distribution and two synthesised array patterns, for a scan angle of θ = 30° and φ = 10° (left side) and for a scan angle of θ = 50° and φ = 70° (on the right). 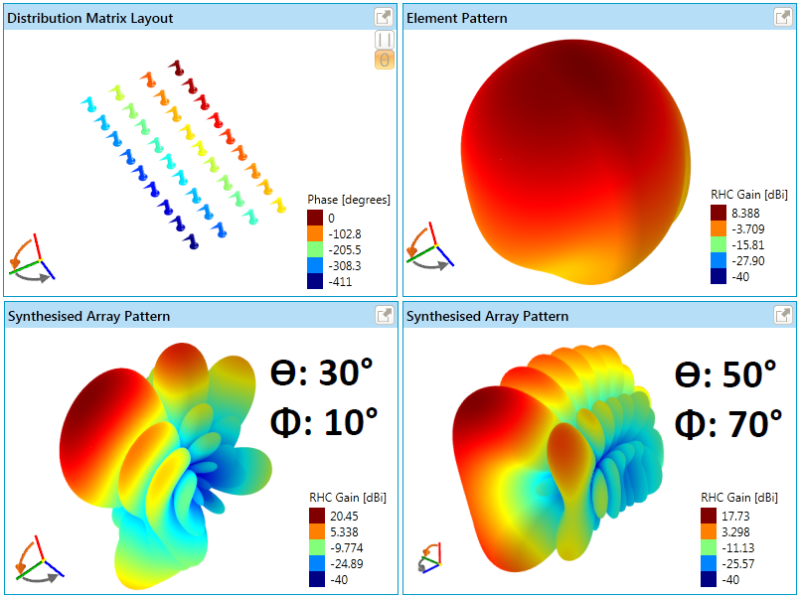 The array calculation in Antenna Magus uses the imported circularly polarized array element pattern as exported from CST Studio Suite. Fig. 6 shows the synthesised array layout with phase distribution and two synthesised array patterns, for a scan angle of θ = 30° and φ = 10° (left side) and for a scan angle of θ = 50° and φ = 70° (on the right). The distribution matrix is exported from Antenna Magus into CST Studio Suite using the array wizard feature to create the final 36 element array with the same squint angles as used in Antenna Magus. The final CST array and simulated results are shown in Fig. 7. The difference between the Antenna Magus and CST simulated pattern results are due to the fact that Antenna Magus does not compensate for corner and edge elements or mutual coupling between elements. It assumes the same radiation pattern for all elements. As expected, the difference is more noticeable as the squint angle increases (compare Fig. 6 bottom right with Fig. 7 (b)), because here the edge and corner elements have a greater effect on the radiated pattern. This illustrates the advantage of using Antenna Magus to assist with fast first order array synthesis and closing the loop, using a full wave simulation tool like CST MICROWAVE STUDIO. Fig. 7: Layout and radiation pattern of 36 element L-band array designs for squinted patterns of (a) θ = 30° and φ = 10° and (b) θ = 50° and φ = 70°, simulated in CST MICROWAVE STUDIO. It was shown how Antenna Magus and CST Studio Suite are utilised to design an L-band planar array for Inmarsat 4 mobile satellite communication. Unwanted mutual coupling was reduced by physical element shielding cavities and redesign. The final design meets the given specifications. Further investigation can be done to realise the physical feed network and to further reduce mutual coupling and element port coupling. This array design uses the same element for centre, side and corner elements. Specific corner and side element design can further improve the array's performance at higher squint angles. C.A. Balanis, Modern Antenna Handbook, John Wiley & Sons, pp. 135 - 137, 20 Sep 2011. Rod B. Waterhouse, "Design of Probe-Fed Stacked Patches", IEEE Transactions on Antennas and Propagation, vol. 47, no. 12, December 1999. 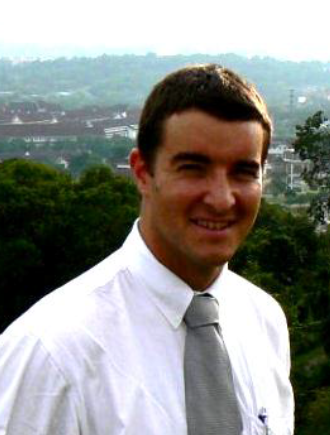 Robert Kellerman completed his Msc.Eng in Electrical and Electronic Engineering at the University of Stellenbosch in 2004. He gained experience in project engineering and high frequency simulations at EM Software in Systems where after he joined a group of engineers who started Magus (Pty) Ltd, developers of antenna design software, Antenna Magus. He is currently the Sales and Marketing Director at Magus (Pty) Ltd. Other interests include surfing, composing and recording his own music.